El Greco will always be Domenicos Theotokopoulos for Greece and there are five exhibitions in Athens alone to prove that. As a tribute to the 400th anniversary of the death of the Spanish Renaissance artist, several art exhibitions are being held in Museums around the world, five of which in the city of Athens alone. It wasn't until 1960, when documents that recorded his presence on Crete, were discovered, that we found out about his presence on Crete, as an apprenticeship in a Byzantine workshop. Even though his nickname meaning "the Greek" in Spanish, did show his descent, there were no traces of him in Greece. He was aware and proud of his Greek origin, though, and up until his death in 1614 he always signed his works in Greek as Doménikos Theotokópoulos. Doménikos Theotokópoulos is the most important figure in the history of Crete, and Greece's most famous artist since Phidias. The fact that most people believe he is Spanish, is upsetting for the Cretans. After having studied iconography in Candia (aka Crete), he moved to Venice in 1567 at the age of 26, then to Rome, before finally settling in Toledo, Spain. There, his inspiration flourished establishing him as the precursor to modern art. He never returned to Greece. For many years he was seen as an outcast and his art was considered extravagant, unnatural even. In spite of the unprecedentedly spiritual images of Christianity in his paintings, El Greco himself was not a religious man. He received several major commissions that helped him produce some of his most dramatic and expressionistic works. Two books though, found in 1982, reveal his personal opinions on art and architecture. Drawn into Spanish mysticism, he went on to sketch serpentine figures and dark alchemic stereotypes, mixing cubism and geometry into his subjective inspiration, discarding proportion and classic realism. The curtain of the series of the tribute exhibitions in Athens, as 2014 was named year of El Greco, went up on 12 November at The Benaki Museum, with "The friendly circle of Greco in Toledo." From 20 November, "El Greco between Venice and Rome", presented at the Historical Museum of Crete , focusing on two of the Cretan paintings "Maistrou" ("Baptism of Christ" and "View of Mount Sinai and the Monastery") set out in Heraklion institution. Another work of the artist, the "Burial of Christ" is featured at the Museum of Cycladic Art from 14 November at Cycladic Art, exhibited digitally - baring a small tribute to the "Death in his Greco." The Byzantine and Christian museum announced a retrospective called Doménikos Theotokópoulos before El Greco, which opened on 4 December. 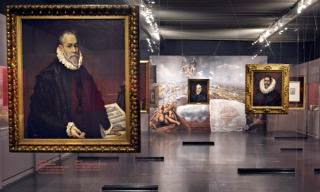 Moreover, a digital museum with monumental works of El Greco in Toledo and the Escorial is set up this month at the National Gallery, including his famous "Espolio" and the "Burial of the Count of Orgaz" creations. Crete also hosted an exhibition detailing El Greco's life earlier this year, entitled "between Venice and Rome" raising funds to acquire two icons painted by the artist, during his time on the island.